Care and supervision for school age children - before school, lunch time and after school. We accommodate early dismissals, Professional Days, Christmas, Winter, Spring, Easter and Summer breaks. Fees for this program are in three categories, depending on your usage. There are separate fees for the summer; billing is by the week or month. Located at Dover Community Centre the program serves children that attend West Dover and Saint Damien elementary schools. Throughout the summer break we take children from across the city provided there is space. We provide nutritional snacks and offer a wide variety of activities and field trips throughout the year. 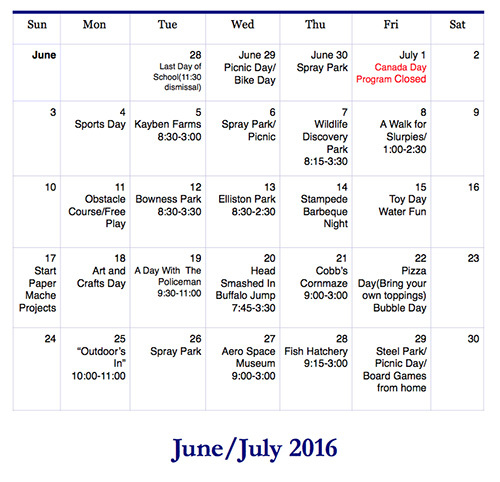 Over the summer months the program generally has two off site trips per week. Costs for the trips are included in the fee. We are an Emergent Curriculum based program, which is an approach that gives value to children’s ideas and interests. We hold group meetings with the children to gather their ideas and interests then incorporate them in the implementation of our curriculum plans. We believe that by doing so, we are helping our children develop their self-esteem, self-confidence and decision-making skills, which is very important in later stages of their lives. The program also provides activities that nurture the children’s cognitive, emotional, social, physical and language skills. Child care subsidy is available.